Jacqueline du Pré (1945-1987) was one of the world’s great cellists. At age 11, she won the most prestigious cello award in Britain and was an established artist at twenty. At twenty-one, she married young conductor and pianist Daniel Barenboim. Six years later, her career was over. She had developed multiple sclerosis, and died slowly over the next fifteen years. During those years she continued to believe that she would recover, taught the cello and went out in her wheelchair. Carol Easton came to know Jacqueline well during her last five years, when the cellist had begun to work with a psychoanalyst. 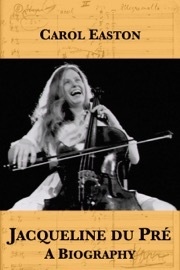 In addition to her own interviews with Jacqueline, Easton interviewed more than one hundred people who had known the cellist.